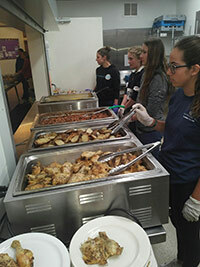 Working on the line, plates of chicken, potatoes, beans, corn and pasta salad, were piled high and served to the men and women who came out of the bitterly cold night for some respite and a warm meal. Veterans, mentally ill and drug addicted individuals received the more than 120 meals served to the homeless that evening. The experience was extremely moving and humbling knowing that as soon as the meal period was over these folks would be returning outside and into the single digit temperatures. The number of people Bridge House services continues to grow every year, despite the wealth in the local community. 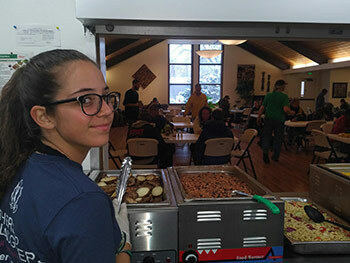 Bridge House is seeing a significant number of newly homeless that have lost businesses, homes, and families in the economic chaos and, has more families coming to evening dinners than ever before; at least one family with children per week…Bridge House served over 100,000 meals in 2017. Through their case management services and amazing Ready to Work program Bridge House provides opportunities for each person to find his or her path to self-sufficiency. But no path is the same and they see a wide variety of people, from all walks of life. Their goal is to connect every person with the services they need. 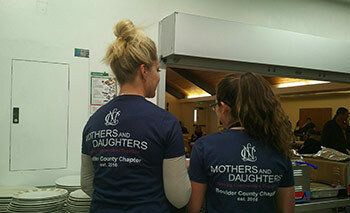 As a volunteer organization serving Bridge House and other local charitable entities, National Charity League fosters mother-daughter relationships in a philanthropic organization committed to community service, leadership development and cultural experiences. Through this bond, National Charity League develops strong women leaders serving and impacting communities today and for generations to come. Special thanks to Bern and Issy for bringing it From the Heart and serving their local Boulder community. PreviousPrevious post:There’s No Partnership without Loyalty and TrustNextNext post:Google-mageddon Approaches: Is Your Site Safe?